We offer full day (9 hours) and half day (5 hours) trips. Depending on the time of year we can customize your trip to target Grouper, Snapper, Amberjack, King Mackerel, Blackfin Tuna, Sailfish, Dolphin (not Flipper), and Wahoo. If you are just out to pull on a fish and species is not preference, our crew will put you in the action no matter what time of the year. Please call Capt. Joe if you would like to know what is biting!! Long Range Yellowfin Tuna trips are available from April to September. If Yellowfin, Marlin, wahoo, and big Dolphin are what you seek, this is the trip for you. In the summer months, birds congregate 60-130 miles offshore of Port Canaveral feeding on migrating baitfish. With massive amounts of bait, comes these vicious predators. There are only 1 or 2 other charter services out of Port Canaveral that provide these trips, due to the speed and range limitations needed to make this trip in one day. The Blackout has a cruising speed of 30 knots and a range of 500+ miles, giving anglers plenty of time to fill the box. Shark trips are available all year around. These trips are generally run in the late afternoon and are great for those who do not want to venture too far from land. Cape Canaveral has a good number of Black Tip, Sand Tiger, Lemon, Nurse, and Sandbar Sharks that can range from 50-400lbs. full day (approx 9 hours) is $800. half day (approx 5 hours) is $600. Special trips are available at your request. full day (approx 9 hours) is $750. half day (approx 5 hours) is $550. Children eight years old and above are welcome. Capt. Joe and his crew are very family oriented and welcome young anglers. 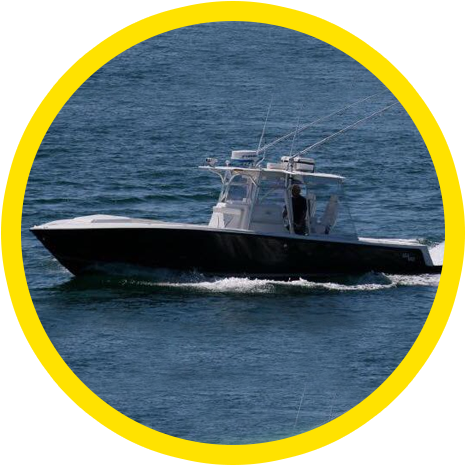 State of the art rods and reels, tackle, bait, ice, fishing license, fish cleaning and very friendly and professional personnel. Food, drinks (no hard liquor please), non black sole shoes, towels, hat, sunscreen (No Aerosol Please), sunglasses, rain gear, and ziploc bags for fillets. If you cancel prior to 72 hours there is no charge. Cancellations less than 72 hours there will be a $100 charge. If we cancel due to bad weather (for your safety), there will be no charge. A $25 convenience fee will be added to all charters paid by credit card. It is customary to tip the mate or captain 15-20% for excellent service. Remember their day is 3-4 hours longer than the actual trip. Why choose a center console? More Fresh Air = Less Sea Sickness. Motion sickness is a product of confusion of the equalibrium from motion. Add the motion with Diesel fumes, heat, and lack of fresh air from traditional covered boats and you have a recipe for a very miserable day. Center Consoles ensure you have fresh air the entire day without having to even get a whiff of diesel fumes. Visibility of the Horizon= Less Sea Sickness. Because motion sickness is caused from a disturbed equilibrium, the worst thing you can do is go inside an enclosed space. Center Consoles ensure you will always have visibility of the horizon with very little upsetting your equilibrium. We have seen more people sick on 50ft enclosed boats than we have ever seen on our boats. Fishability. One of the greatest attributes of a Center Console is its ability to allow anglers to fish 360 degrees around the boat. If your fish runs to the bow, all you have to do is follow the fish without maneuvering the boat. This allows us to hook up multiple fish and spend more time maximizing hookups instead of maneuvering the boat. Traditional enclosed boats must get off of the fishing spot to cater to the ONE fish that runs to the bow because the angler is limited to the small cockpit in the back. Speed. 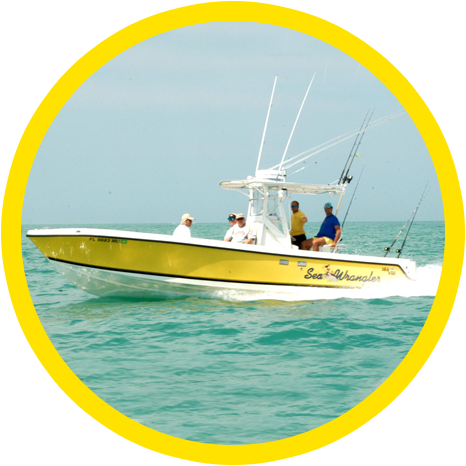 Our boats are the fastest charter boats out of Port Canaveral by about 9 knots. This gives you more fishing time and less travel. It also allows us the options of running further and not being limited to one area if the fish start biting elsewhere throughout the day.